Blauert's and Xiang's "Acoustics for Engineers" provides the material for an introductory course in engineering acoustics for students with basic knowledge in mathematics. In the second, enlarged edition, the teaching aspects of the book have been substantially improved. Carefully selected examples illustrate the application of acoustic principles and problems are provided for training. 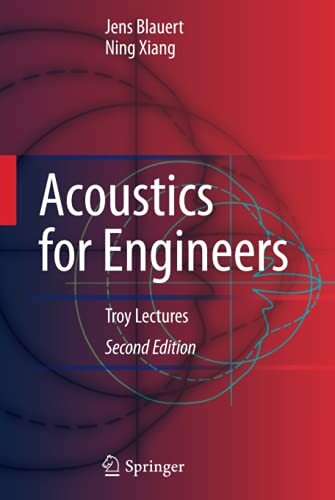 "Acoustics for Engineers" is designed for extensive teaching at the university level. Under the guidance of an academic teacher it is sufficient as the sole textbook for the subject. Each chapter deals with a well defined topic and represents the material for a two-hour lecture. The 15 chapters alternate between more theoretical and more application-oriented concepts. Mechanic and Acoustic Oscillations.- Electromechanic and Electroacoustic Analogies.- Electromechanic and Electroacoustic Transduction.- Magnetic-Field Transducers.- Electric-Field Transducers.- The Wave Equation in Fluids.- Horns and Stepped Ducts.- Spherical Sound Sources and Line Arrays.- Piston Membranes, Diffraction and Scattering.- Dissipation, Reflection, Refraction, and Absorption.- Geometric Acoustics and Diffuse Sound Fields.- Isolation of Air- and Structure-Borne Sound.- Noise Control – A Survey.- Appendices.